Hopefully it never happens to you, but the first section of a 'Worst Case Scenario Handbook' should be what to do if a permanent tooth gets knocked out. Whether you’re an adult or a child, as long as it’s a permanent adult tooth that has been knocked out (avulsed) then repositioning the tooth back into the socket as quickly as possible is critical to increase the likelihood of you keeping the tooth. 1. Pick up the tooth by the crown without touching the root of the tooth. The root of the tooth has very important cells and tissue that we do not want to damage. 2. Inspect the root of the tooth to look for any debris. You may gently rinse the root of the tooth with warm water or cold milk. If neither is readily available, then you can gently dust off any visible debris with your finger (refrain from scrubbing the root). 3. 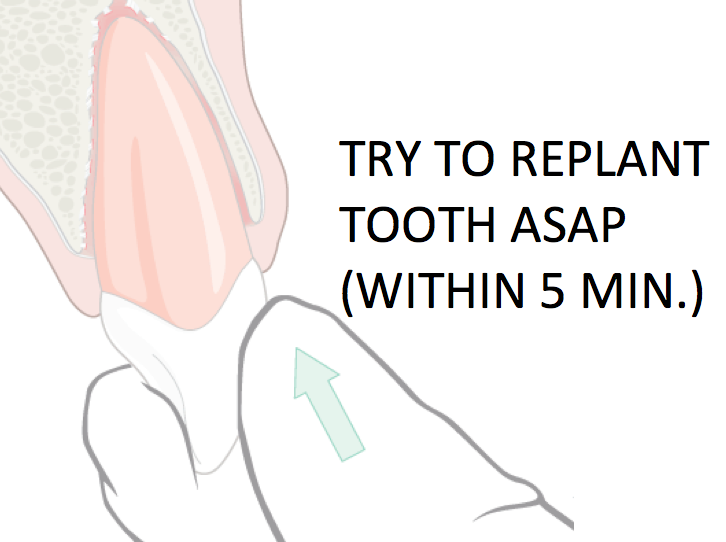 Re-position the tooth back into the socket as close as possible to its original position. 5. Call your dentist immediately so that they can take appropriate measures to further stabilize the tooth. 6. Call your medical doctor as well, to make sure that your tetanus shots are up to date. Studies show that if you reposition the tooth back in the socket within five minutes, it increases the chances that you will be able to keep the tooth. However, you should expect that the tooth will need to be removed in the future. Root resorption (dissolving root) is one of the most common reasons necessitating its extraction in the future. It is understandable if you are unable to reposition the tooth back into the socket. Instead, you will need to keep the tooth hydrated as you make your way to the dentist. Place the tooth into the pocket of your cheek (the space between your molar and the inside of your cheek). If you are concerned about the child swallowing the tooth, then encourage the child to spit into a cup. Then submerge the tooth into the saliva. As soon as you get a chance, transfer the tooth into cold milk or a specially formulated solution for avulsed teeth (ex. Hank's Balanced Salt Solution, Tooth Saver, etc.). So there you have it. Now you have the 'know how' to handle such a dental emergency like a pro!